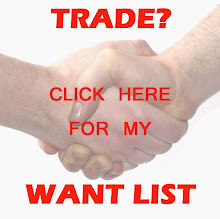 Apparently, a few sellers have gotten the hint. 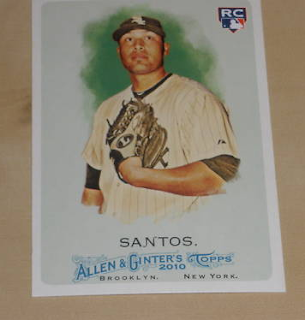 Here's a sampling of a few White Sox 2010 Allen & Ginter cards that have popped up today. A bunch of other base card images have appeared as well. And there are two listings of this card with a picture. No base card pictures, yet. No other insert pictures either. Something is better than nothing. 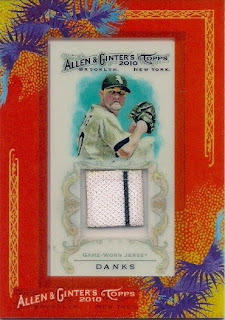 Unless you've been living under a rock today, you know that 2010 Allen & Ginter singles have hit eBay. Unless you're looking for Jason Heyward, you are probably not going to find an actual picture of a base card for the next day or two. That's right. 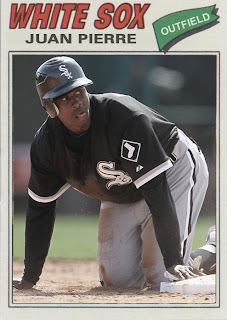 There are absolutely no pictures of any 2010 Allen & Ginter White Sox cards. I'm sure that will change in the next few days, but you can still buy the cards, sight unseen. I do appreciate the effort to put singles on eBay this early, but can sellers please stop using the same generic picture for every base card? Once your cards are up, start scanning some actual cards and replace those generic pictures. As a former seller, I can sympathize with getting the product up as soon as possible. A good chunk of the sales are made when the product is brand spanking new. 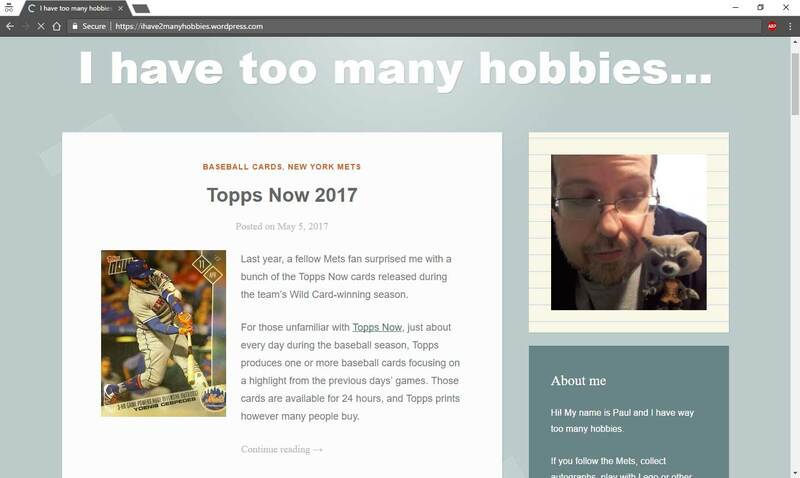 From my own experience, if there is an actual image of the card you are selling on each page, you can extend that initial sales peak for a while longer. The allure of showing the customer that you actually have the card for sale in your possession translates into even more sales. Not that I'm complaining, mind you. I'm just anxious to see pictures of the cards I'll be collecting. 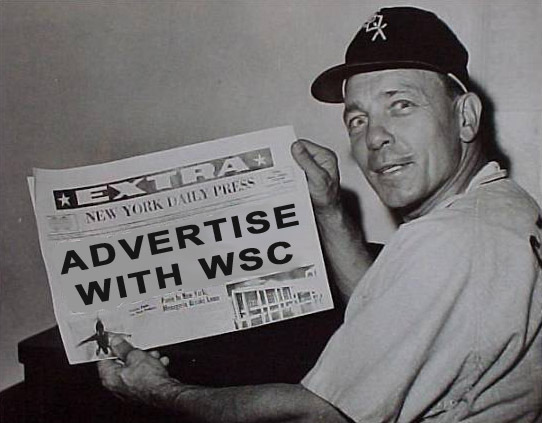 When the first White Sox related images appear, I'll post them here. 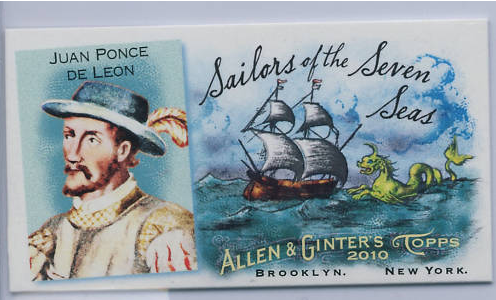 Until then, enjoy the picture of a card above from a cool insert set, Sailors of the Seven Seas. Mark was acquired during the offseason for second baseman Chris Getz and an under-performing Josh Fields. The plan was simple. Move Gordon Beckham to second base to replace Chris Getz and plug Teahen into third base in place of Beckham and Josh Fields. Early in the 2010 season, Mark's defense was suspect and his bat was slow to come around. 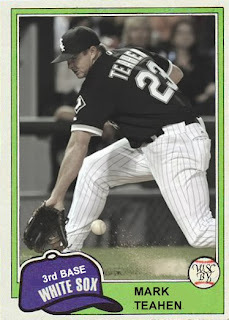 When both were finally showing more consistent signs of life, Teahen broke his finger and was put on the disabled list. Hopefully, this will not be a huge blow to Mark's progress, when he returns. If Teahen lives up to his full potential with the White Sox, Mark could be a permanent fixture at third base, possibly joining the ranks of Robin Ventura and Joe Crede in the hearts of ChiSox fans. 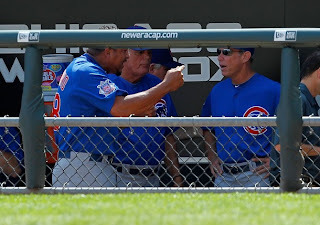 I've had quite enough of Carlos Zambrano's temper tantrums and antics on the field and in the dugout. I can't even imagine how Cubs fans are reacting to a player that they are supposed to root for every five days. There's a difference between being fired up while showing emotions during a game and being crazier than Turkmenbashi. I've seen Mark Buehrle give up seven runs in the first inning and I never saw him chew out Paul Konerko for not doing enough to make a play. I actually thought that Zambrano got out of the first inning with minimal damage done. When he slammed his foot onto first base for the final out, I thought that it was a statement that he wasn't going to give up any more runs. Boy, was I wrong! 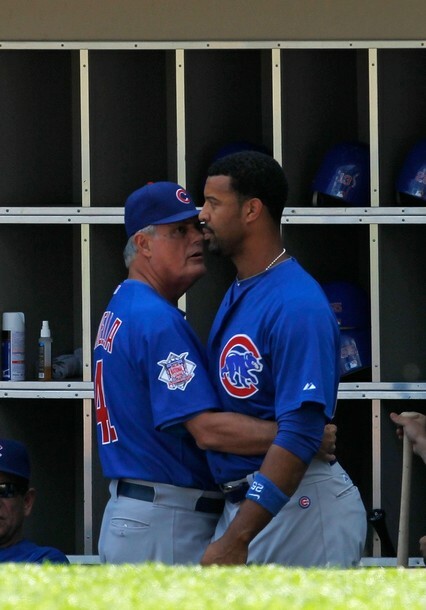 I can't be sure what exactly was said, but I assume it involved a lot of swearing since Sportscenter's coverage included a rapidly appearing and disappearing blur circle over the mouths of Carlos Zambrano and Derrek Lee. It's one thing to vent and be upset that you gave up four runs in an inning. I can't think of a pitcher that wouldn't be the teeniest bit upset about that. The one thing you don't do is take it out on your teammates. Of all the unwritten rules of baseball, that is numero uno. 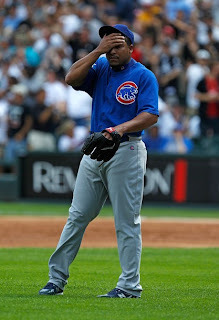 Carlos Zambrano may have passion and fire, but since he can't control the aim of that anger, it becomes a weakness. He may be a different cat off the field, as Ozzie Guillen claims, but on the field, when losing, Zambrano is nothing but a well paid selfish baby. 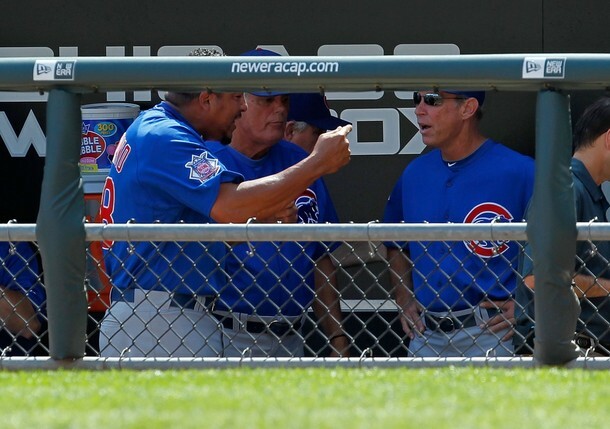 This latest outburst is that absolute last thing the Cubs needed right now. The indefinite suspension of Z puts the Cubs roster at 24, since they cannot replace a suspended player. It also taxes further a bullpen, who just came off a 13 inning game and could have used the rest, instead of coming in at the beginning of the second inning. The Cubs could pay Carlos $45 million to simply go away or the Cubs can pray that Zambrano waives his full no trade clause. I don't see either being an easy option. Zambrano becomes the second player in two years to be suspended by the Cubs organization. They had to go that route with Milton Bradley last year and now Carlos Zambrano. Why do the Cubs go after these head cases? Why do they give out ridiculously high contracts for players who fall well short of expectations? Every club has had a few of these, but the Cubs seem to seek these out more than the majority of teams out there. When Zambrano got the $91.5 million dollar extension in August 2007, I thought it was a big mistake. When Z is in the right frame of mind, he can be lights out and the best pitcher in baseball. Take his 2008 no-hitter. That was a thing of beauty. It seems like it's been all downhill since that point. When Carlos is not in the right frame of mind, he can be a club cancer poisoning every player on the Cubs. Yesterday's meltdown overshadowed a 149 pitch no-hitter by Edwin Jackson and stole the limelight of the White Sox, who won their tenth game in a row, the best streak for the Pale Hose since I was a fetus, in May 1976. It will be interesting to see just what the Cubs do with Carlos Zambrano. Everything negative gets magnified when a team is losing. This outburst didn't need that sort of fuel. It was already a raging fire, out of control. What better way to highlight the Cubs playing at U.S. Cellular Field than to feature one of their current players in a White Sox uniform? 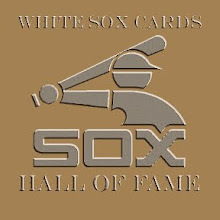 The height of Howry's closing career came in 1999, when he saved 28 games for the White Sox, before bowing to Keith Foulke. After that, Bobby became a part-time closer and frequent setup man. While Howry's longest tenure is with the White Sox, he is currently on his second stint with the Cubs. Bobby ran into some elbow trouble, but made a successful comeback after surgery. When Howry is healthy and in the zone, he can be one of the most lethal arms in the bullpen. He is far removed from his best season (1999) where he struck out 80 and saved 28 games, but he is now a crafty veteran, who can still deal. 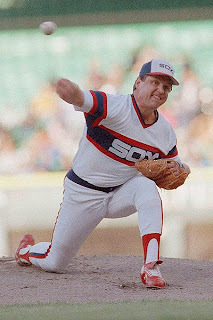 One final thought... did anyone else notice that the majority of the successful White Sox closers in the past 25 years have been named Bobby or some variation of that name? Thigpen, (Roberto) Hernandez, Howry and Jenks. Weird. 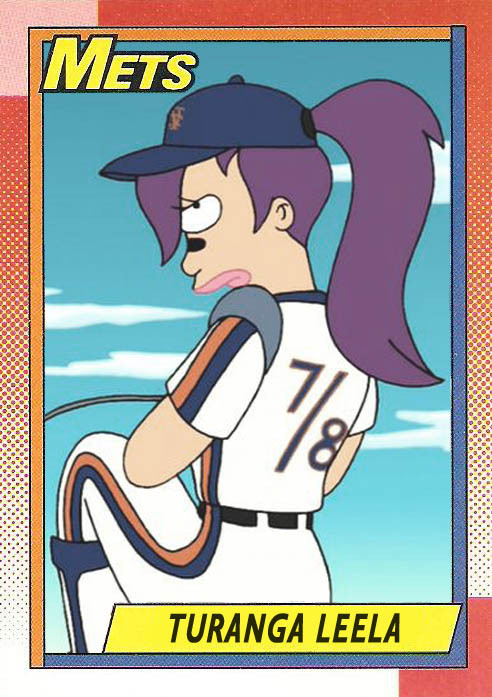 New Futurama Episodes Start Tonight! It's just like the story of the grasshopper and the octopus. All year long, the grasshopper kept burying acorns for winter, while the octopus mooched off his girlfriend and watched TV. But then the winter came, and the grasshopper died, and the octopus ate all his acorns. Also he got a race car. Is any of this getting through to you? One of my pet peeves is not seeing a card of every player on each team. The majority of players who fall into this collecting crack are relief pitchers. Unless a relief pitcher is a closer, chances are said player will get the shaft when it comes to hobby love. 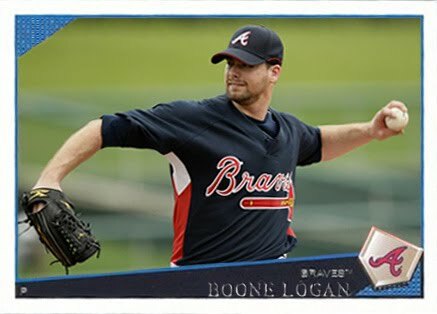 Boone Logan has had appearances in every season since 2006. He's had at least 20 appearances each season between 2006 and 2009. Boone looks to reach that mark this season with the Yankees. Logan's last card was in 2007, when he was with the White Sox. In 2009, he was with the Braves. This year, Boone is with the Yankees. He's likely to get a card sometime this year, since he is with the Yankees. There's an entire Atlanta Braves period that has been completely missed and likely will never be revisited. This card will hopefully correct that oversight. Much like any of the vintage Topps sets that were released in series, the toughest to find were the high numbers. 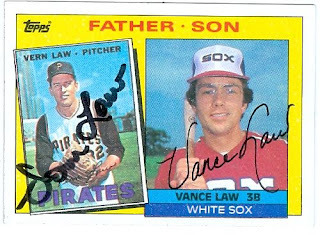 It took forever to find the last two White Sox cards (the three headed Rookies card and Bobby Knoop), but I finally found success on eBay with a little stored up PayPal money. I was finally able to finagle those cards in separate 99 cent auctions. A great big thank you to those who have helped me towards the completion of this set over the past few years. A good chunk of the set was traded and/or donated. It really helped me believe that I could actually finish these vintage sets, without breaking the bank. Little by little, I am accomplishing that goal, even in the face of forced hobby purchasing withdrawals. This team set is something I never thought would be possible, since I did not see a single 1970 Topps card until the last couple of years. What helped the most was the lack of any leaders cards. That is the main culprit keeping me from completing some of the sixties sets. Throw a floating head of Mickey Mantle on a card with other disembodied heads and suddenly the card becomes almost unobtainable at a decent price. It may take time and patience, but eventually the goals are accomplished. Behold, the 1970 Topps White Sox Master Set! 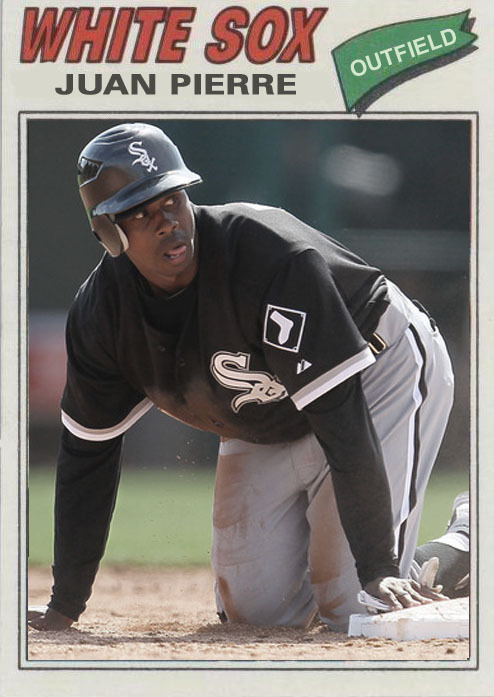 After defecting from Cuba in early 2008, Dayan was declared a free agent and signed a four year contract with the White Sox on December 12, 2008. While some saw this as a risky investment, Dayan has improved at every level since joining the Sox. On June 20, 2010, Viciedo made his MLB debut against the Washington Nationals, going 1 for 4, but hitting the ball with authority in his first three at-bats. In his first at-bat, Nyjer Morgan made a spectacular play to rob Dayan of a sure double. 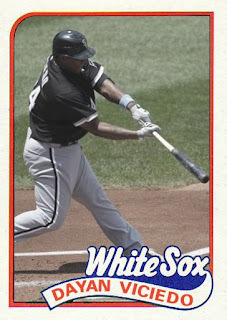 In his second at-bat, Viciedo hit a rocket single. If Dayan continues to show discipline and power at the plate, it may prove difficult to send him back down to AAA. The future appears bright for this young slugger. Will The Sox Run Into This Guy Tonight? 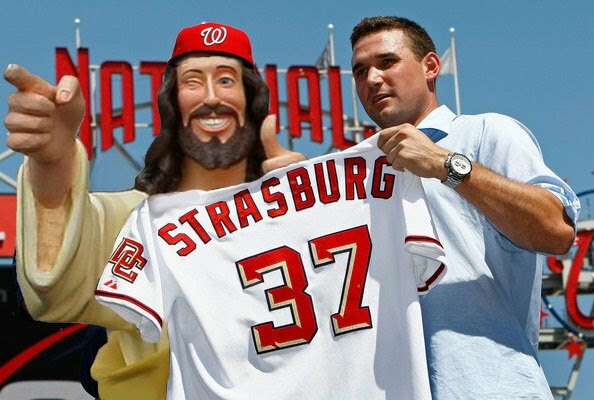 Or is this the guy that Nationals fans are hoping shows up for tonight's game in DC? Either way, it should be an interesting game. The 1985 Woolworth's set was a 44 card mix of past and then-current stars. The only White Sox player to grace the set is Ed Walsh. Ed is said to have played an intricate part in the design of the original Comiskey Park. For the majority of the park's life, it was known as a pitcher's park. That was due to the influence of Ed Walsh. Walsh hold the record for lowest career ERA with 1.82. He set a modern MLB record with 464 innings pitched in 1908. Walsh's best season came in 1908 when he went 40–15 with 269 strikeouts, 6 saves and a 1.42 ERA. In 1910, he managed a 1.27 ERA which is the lowest for a pitcher with at least 20 starts with losing record. Ed pitched and won two games in one day on two different occasions. September 26, 1905 and September 29, 1908. He also tied a MLB record for pitching the most consecutive complete games by club with three. Two of those games were on September 29th against Boston and the third was on October 2nd in Cleveland. I thought I'd show off this pull I received from the I Am Joe Collector box break. Beckham may be in a lull period right now, but there are signs that he is breaking out of it. Regardless if he rights himself or not, I'm very happy to have this in my collection. As for me, I'm taking the day off. I'll be dock fishing with my dad on the Chain O' Lakes today. Something nice and relaxing, with a bit of sun. Ed started his career in Chicago as a draft pick from the Milwaukee Braves in the 1964 first-year draft. He saw two games in 1967 with the parent club. Herrmann was back up with the Sox in 1969 and remained a fixture behind the plate until 1974. The White Sox have a long history with above average catchers and Ed is no exception. With his time on the White Sox, he was a slugger (in seventies terms) that had a decent arm for throwing out base runners. Herrmann logged a lot of games at catcher for the Sox and showed that he could handle the Pale Hose pitching staff. In his last season with Chicago, Ed made the All-Star team. On April 1, 1975, Ed was traded to the Yankees for four minor league players and cash. Brian Downing was waiting in the wings and the Sox figured that Ed was expendable. Were they right? 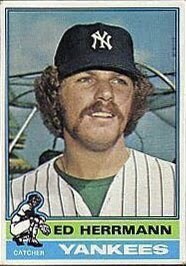 Ed was only 80 games for the Yankees in 1975, more often than not as a designated hitter. His average dipped only slightly, but his playing time was greatly reduced. 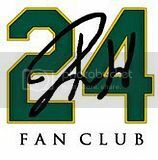 Ed bounced around from team to team for the rest of his career, which lasted until 1978 in Montreal. Brian went from being a part time outfielder and catcher to a full time catcher. His average was slightly below where Ed's was and the power numbers were lacking. Brian stuck around until the end of 1977, where he was traded to the Angels with Dave Frost and Chris Knapp for Bobby Bonds, Thad Bosley and Richard Dotson. Offered in packages of Rold Gold pretzels in 1970, this 15 card set celebrated the greatest players in the first 100 years of the majors. The Rold Gold set is a bit harder to find than the almost identical 1972 Kellogg's set, which borrowed everything except the copyright date. 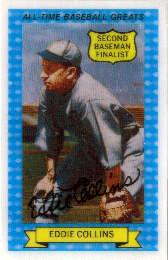 The way to distinguish the rarer Rold Gold set from the much more common Kellogg's set is to look for the 1970 copyright date on the back of the card. In 1970, kids didn't see the potential in a 3-D card set with long since retired players. Many of the cards were thrown away, due to lack of interest. There still isn't much interest in this set today. If you look hard enough, you can put together this 15 card set of Hall of Fame players for a fraction of the cost of other vintage sets. 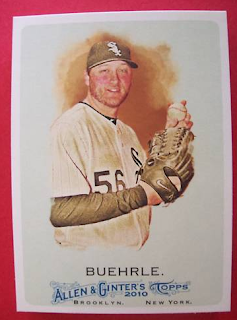 In a card set which consists of only fifteen cards and two are of Babe Ruth, one White Sox card is pretty decent. I'm sure a case could be made for a few other White Sox players, but I have no complaints for a set this small. This set brings the feeling of the seventies cereal sets with a twist. The fact that the set was reprinted as a cereal set just hammers home that point more. This is a nice little niche set that shouldn't be too difficult to find. Juan D'Vaughn Pierre came to the White Sox through a trade with the Dodgers. Two top pitching prospects went to Los Angeles, while Pierre came to Chicago in the December 2009 trade. Juan was the answer to the Scott Podsednik problem after the 2009 season. Pierre is a clear upgrade defensively from Podsednik, but Juan doesn't have the same arm that he once had. In Pierre, the Sox have a true leadoff hitter, who is not a liability on the bases. The longer Juan plays with the Sox, the better he becomes. As the games play on, Pierre has found better ways to get on base and more ways to steal bases, once he's at first. If he continues this path, the Sox will be in a much better position at the All-Star break. I still have the last strains of "Chelsea Dagger" running through my head from the Blackhawks rally earlier. I didn't attend, but I watched it on television. It reminded me so much of the 2005 rally for the White Sox. I hope I see something like that again in my lifetime. Lown and Staley were a big reason for the success of the 1959 team. Each put in at least 60 appearances in 1959. Some might say that would be overworking those two, but when a season is on the line, a team tend to go more with what is working. Remember, this is a time where the complete game was king. To have two pitchers clocking in at least 60 appearances was a rarity on a good team. I chose this card for two reasons. I missed last week's spotlight, due to illness, so this is like a vintage two for one. After 33 years of my life passing by without having this card in my collection, I received two of this card in the mail on the same day. One was won in a cheap auction with some PayPal mad money and the other was part of a blind trade. Both are completely awesome! I never associated this card with the 1960 Topps set because it wasn't horizontal and did not show the same type of design as the regular cards in the set. At least with the coaches cards, you can tell that the same basic design is used. Not so with Win Savers. I suppose if I had been around to collect the set in 1960, every card from the set would be associated with the 1960 Topps set, in my mind. It's the little oddities about vintage sets that I love. This has to be one of my favorites. Note: This is a post about the last week and a half of my life, which has nothing to do with baseball, cards, and other fun stuff. The night of May 30th, 2010, I felt a little lethargic and went to bed earlier than usual on a Saturday night. Little did I know that I would start a week and a half trip down the strangest path I have ever taken. Strange, only because I have no idea what happened. Sunday and Monday saw mostly sleep and had little appetite. I pushed the water though, because I did not want to get dehydrated. Monday night, my appetite returned, so I sat down to watch Game 2 of the NHL Finals with some snacks and some chilled bottled waters. The Blackhawks won and I was on the road to recovery... or so I thought. Tuesday morning, I woke up with a pain in my lower right back. I initially thought that this was the result of sleeping the better part of two days away. If you don't move your muscles, they tend to cramp up on you, or at least that's how they work for me. I figured if I keep drinking water and keep moving around, it'll work itself out. For good measure, I did some back exercises. I'm no stranger to having a bad back, so I'm usually prepared in how to handle it. The pain only got worse. So I thought, "Great! My second kidney stone!" The last time I went through that pain was in 2003. I had the benefit of a morphine shot at the hospital to pass the stone. This didn't feel as bad as a kidney stone, but the pain seemed to be in the same general area. The pain waxed and waned from excruciating to somewhat tolerable in the following days. I was starting to lose sleep and a little bit of sanity. I decided I would try to see my doctor on Thursday afternoon. There's only so much you can do in an office that's not in a hospital. He wrote some antibiotic scripts and told me to go to his hospital for some outpatient tests on Friday morning. Fortunately for me and unfortunately for my doctor, the pain was in a low period every time that I saw him. Friday morning, my white cell count was high and so were my creatinine numbers. Not alarmingly so, but enough to be concerned. An ultrasound and x-rays ruled out kidney stones, gall stones, bone problems and basically any other theory that was suggested. By this time, constipation had me in its grasp for a few days, which just added to the problems. I was told to go home, push the fluids and see what the weekend brings. If I felt bad enough, I could always come through the ER. The weekend brought the worst pain of my life. I have a high tolerance for pain, but even I was having trouble with this level. I had to go have followup tests on Monday morning to compare to the ones on Friday, so I figured I would just stick it out. In retrospect, that was probably the best idea, but it didn't appear that way during everything. Lack of quality sleep, lack of proper eating, an overabundant amount of liquids and intolerable levels of pain finally caught up with me. I looked at my face in the mirror and did not recognize the person staring back at me. Trying to analyze my symptoms logically, I tried to make the pieces fit and came up with some real doozies. Did I accidentally swallow a kalamata olive pit? Could someone have poisoned me? Since I felt better away from the house, could there be an airborne toxin around my bedroom? I'm not proud of any of those thoughts, but I was grasping at straws for a plausible explanation. By Monday, I couldn't take the pain anymore. 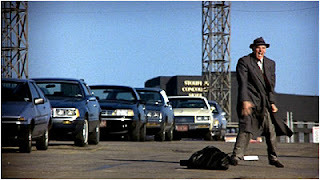 It was like Andy Kaufman was playing the bongos on my lower right back with a steady beat. The pulsating pain, I think, is what was the absolute worst feeling among everything. My doctor decided to admit me for observation. I'd get an IV hooked up and get my levels back to normal and figure out what was going on. Then the admissions office denied my admission. Since I did not come through the ER, had no insurance and had no present job, they refused me. I'm not sure what my doctor yelled to persuade them, but soon they were welcoming me with open arms. Gotta love a doctor like that. I was admitted and all that was left was to put in an IV and to secure a room. First, the nurses accused me of being a vampire. I had no veins. Then they found faint veins and failed at every single attempt to strike it. Left hand: fail. Right hand: fail. Left elbow: fail. Right elbow: fail. The decided to wait until they found a vein in one of the forearms before they tried again. They failed to find a vein. An IV specialist was brought in. She stuck me once in the right forearm, before she declared me a lost cause. I was going to get a pickline. My dad had a pickline in earlier this year, so I knew what it was and he told me it didn't hurt at all. A long tube going from my arm to my chest, inside of me, sounded painful. To my surprise, I felt nothing. Soon after an x-ray, to make sure the line was in the right place, I was hooked up and ready to go. All my levels were normal and I was released in less than 24 hours. I wasn't quite out of the woods yet. After spending an uncomfortable, hot, sticky night in a bed that self adjusted, I left with different pains in my back. I threw my back out, sleeping in a hospital bed overnight. Let that sink in for a second. I went into the hospital with one pain in my back only to be replaced by a completely different pain in the same general area of my back. Got that? Yeah. I know. It's completely screwed up. Every time I would get into a comfortable position, the bed would auto correct itself and sink me into a position that did not support my back properly. Yesterday, everything finally went back into place and I couldn't be feeling better. So what does my doctor think happened to me? No one has a clue! They just know that whatever they did, it helped. If that's not the scariest part of the last week and a half, I don't know what is. I want to thank everyone who sent messages and well wishes in the past week and a half. They really uplifted my spirits and helped my sanity. 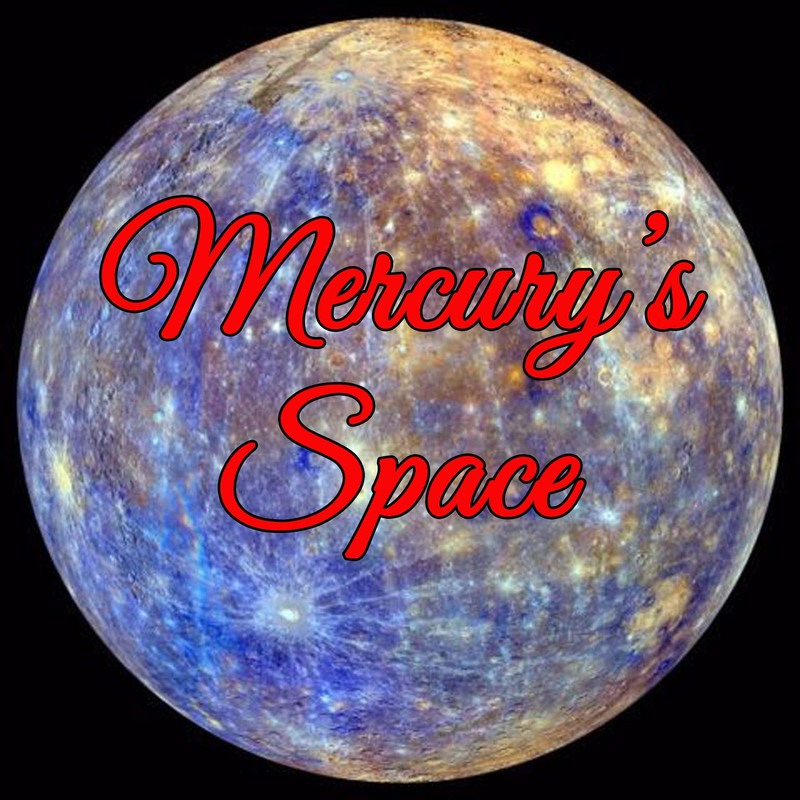 We now join our regularly scheduled blog, which is already in progress. It's been a long time for the revitalized franchise. It's great to see them on top of the hockey world again! The run to the Stanley Cup has been one of the most exciting in recent sports memory. Nothing will take away from the Sox winning it all in 2005, but this is a different type of animal and I am proud to say that I've been watching all season. This is exactly what the Blackhawks and Chicago need. Each other, in a more positive light. The Hawks have been the joke of the NHL for far too long. I might have become a more die hard fan, if not for the long standing blacked out home game rule. Thankfully, that rule has been abolished and I have been able to get into the Hawks more in the last few seasons. It was a long road to the victory last night and the overtime ending was one of the strangest I have ever seen to win a championship. I think that's what makes this win and this team endure in my heart. Against all odds, they played their hearts out and won it all. I can always get behind a team like that. Congratulations, Blackhawks! You are now relevant again. Enjoy your well deserved championship! Pictured left to right; Duncan Keith, Brent Seabrook, John Danks, Jonathan Toews and Patrick Kane. There will probably be no new posts for a day or two, while I try to pass this kidney stone. I invite you to laugh at my pain by watching the video below. How do you possibly compile a list of games that you've seen without forgetting some or ranking them out of order of importance? You don't. I'll try anyway. Brian, at 30-Year Old Cardboard, issued a challenge to bloggers to compile such a list. Here is my attempt. The Sox are playing the Cubs in an exhibition game, when Chicago gets its first look at Michael Jordan playing baseball up and close. Jordan did not disappoint, going 2 for 4 with a run-scoring double. 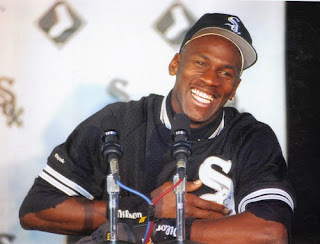 If the strike did not happen in 1994, there was a possibility of MJ being called up in September. Chicago was abuzz and my friends and I could not get enough. Jermaine Dye and Paul Konerko do the impossible by becoming the first teammates to hit their respective 300th career home runs back to back. After seeing that happen, I thought anything was possible for the season. 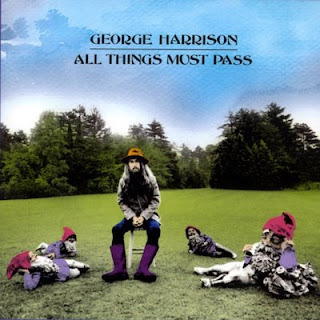 For the first time in my lifetime, a seemingly impossible record fell. It wouldn't be the last time that happened, but this was the game that made me stand up and take notice of modern ballplayers and how they could have a lasting impact on the history of the game. Mark Buehrle faces the minimum 27 batters to record his first no-hitter. Sammy "The Cheat" Sosa spoils the perfect game with a walk, but promptly gets picked off first base by one of Buehrle's superb moves. My mom and I cheered almost as much when Sosa got picked off as when Buehrle won. 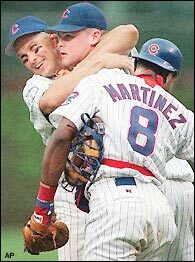 This was the official start of Kerry Wood mania in Chicago. There was nowhere anyone could escape to where you didn't run into someone with a Wood jersey. This began an expectation of near impossible odds that Kerry never quite matched. It remains one of my favorite Cubs related memories. The longest game innings-wise in MLB history ended with a Harold Baines home run and a save by Tom Seaver. Seaver went on to win the game scheduled for May 9th, achieving that rare feat of saving a game and winning a game on the same day without the benefit of a doubleheader. 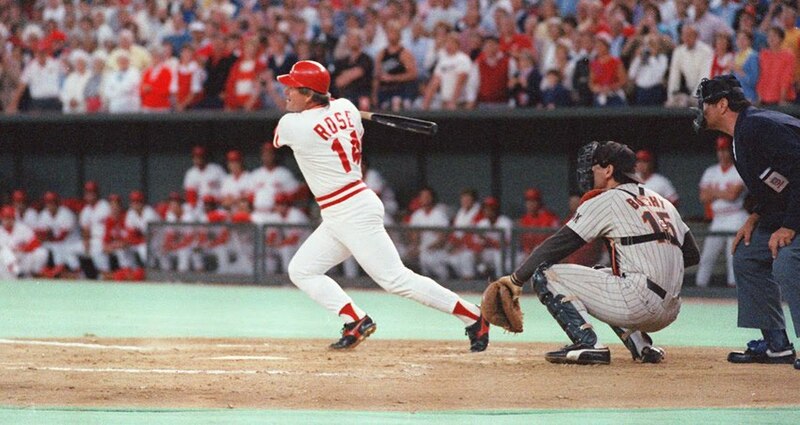 Carlton Fisk set a catching record that still stands today of 25 innings caught in a single game. This game taught me to hang on until the bitter end. In a do or die game for the White Sox, Alexei Ramirez unleashed his fourth grand slam of the season, breaking an AL rookie record and breaking the team record for most grand slams in a season. This win helped the Sox towards the playoffs and vindicated a season marred by underachieving. One of the first games I can remember deliberately watching after the 1994 strike, my family and I gathered around the television to watch history unfold. 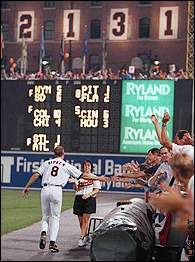 Unlike a phony home run race three years after this, Cal Ripken's moment cannot be tarnished. We saw a great man accomplish the impossible and baseball was OK again. Mark Buehrle leaves out the walk this time. I never thought I'd actually see a perfect game unfold before me, but there it was. DeWayne Wise's catch made my heart stop. I anticipated each bobble with a reserved caution. I could not breathe or the ball would certainly trickle out of the glove. Wise hung on and one of the greatest sports moments that I have ever witnessed came to fruition. It couldn't have happened to a nicer guy. I was at my Cubs friend's house watching Game 4 of the 2005 World Series, which was the absolute last place I wanted to be. My friend has a nasty habit of changing the channel at key moments because he's bored. That did happen, but thankfully not at any key moments. Since it was just the two of us, I was very reserved. I broke out my celebratory cigar and had to go outside to light it. I quickly left the premises and made the rounds to all my friends that were stuck working. My victory lap was full of smiles and great moments. It has to be the number one moment on this list. There are thousands of moments that shaped my life in baseball. These are all top 10 worthy. On a different day, the list may play out differently. #11 would be Wilson Alvarez's no-hitter in 1991. I was on the phone with my grandfather for the ninth inning. It was a special time for me because we mostly bonded between baseball, since he lived in Dallas. Even though I did not attend any of these games, each of these moments helped shape me into the fan that I am today. I guess you could call that better living through television.